The Pioneer DDJ-RZX Rekordbox Controller is a professional-grade, 4-channel controller designed specifically for use with rekordbox dj & rekordbox video. The Pioneer DDJ-RZX is the ultimate controller for any DJ, providing a familiar layout with exceptional audio quality ranging up to 96kHz in sample rates. The large jog wheels are accompanied by the three 7-inch touch screen displays, that provide direct access for information such as track ID, BPM, waveforms and more. These displays will also preview video and image files when used with rekordbox video. The Pioneer DDJ-RZX also features a range of pro-DJ FX controls, for everything from Reverbs and Delays to Loops, Rolls and more. It also features two built-in USB sound cards for connecting your controller directly to your computer. 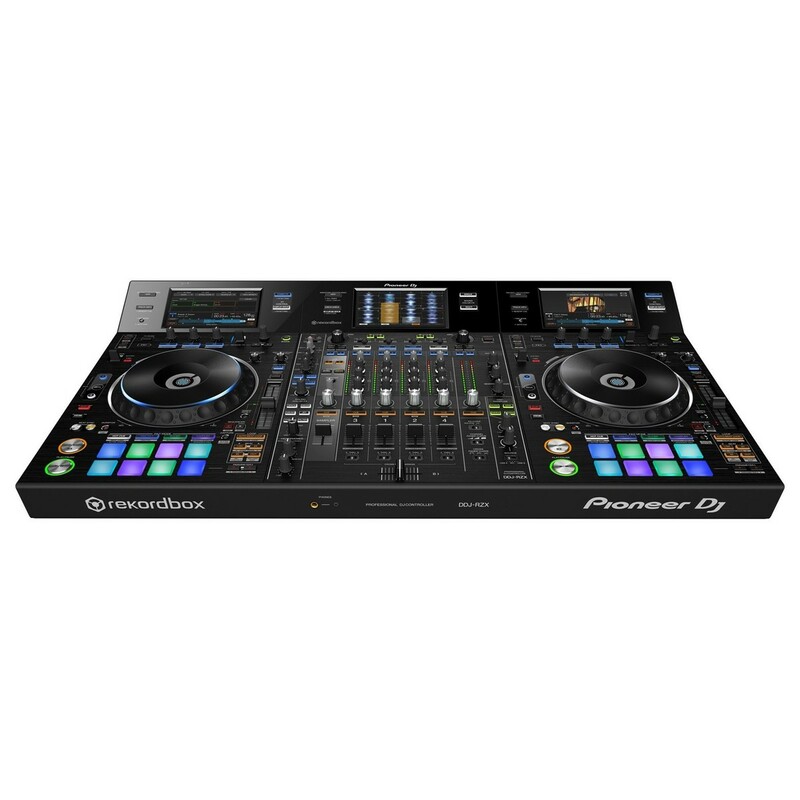 The Pioneer DDJ-RZX Rekordbox Controller is one of the most advanced professional DJ controllers on the market, with two integrated USB sound cards and a wide range of future-proof technology. Its highly portable design makes it ideal for DJs on the move, providing you with a familiar and ergonomic layout designed for optimal flexibility. The large jog wheels provide a smooth operation ideal for both scratching and mixing applications. The Pioneer DDJ-RZX Controller is specifically designed for use with rekordbox DJ and rekordbox video, allowing you to use the wide range of settings and in-depth controls to bring out the best from your controller. The trilogy of large touch-screens provide vital information about your media such as track title, BPM and key using deck display mode. The 7-inch touch screens can also display the waveforms of your songs in the middle display, which you can zoom in on for visual monitoring. You can also use the displays to preview video and image files, trigger FX and adjust parameters by using the X and Y axis on the displays. When used in conjunction with rekordbox DJ and rekordbox video, The DDJ-RZX can be expanded with a range of new performance tools, as well as giving you the ability to preview and cue video files directly from the touch-screens. In addition the wide range of controls, the DDJ-RZX controller features two built-in USB sound cards as well as internal AD/DA converters. The AC inlets provide reduced cable contact resistance for optimal signal integrity. The 96kHz/32-bit D/A converter made by Asahi Kasei, captures every nuance of your source audio, retaining the natural harmonic character the original. Combined with the low-jitter clock IC and the 96kHz/24 bit USB sound card ensures optimal audio quality and performance. 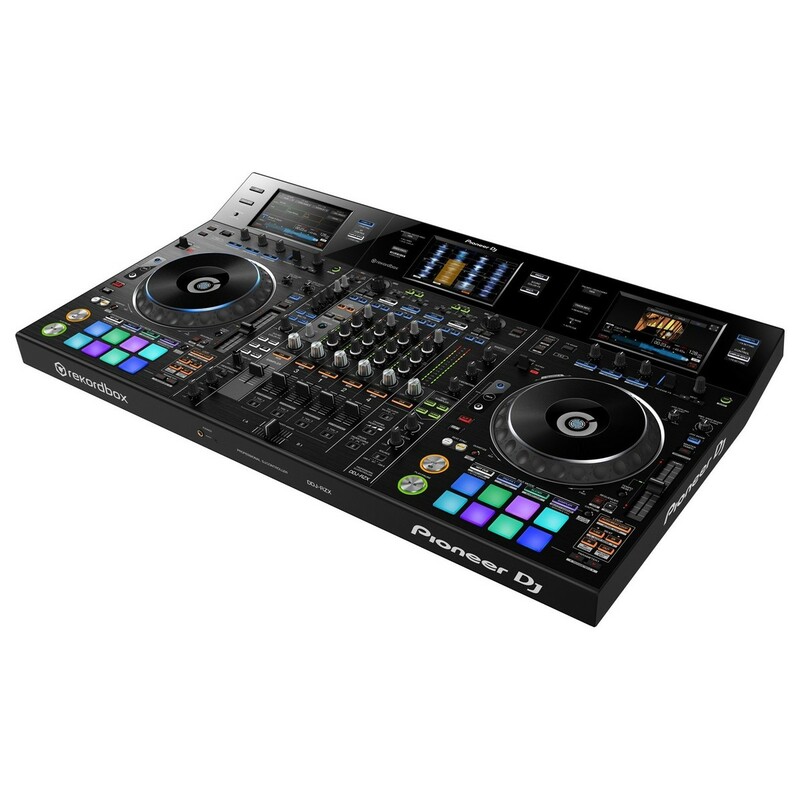 The Pioneer DDJ-RZX features a myriad of premium-grade performance controls including 16 MPC style, velocity sensitive pads, with 8 on each channel. The velocity sensitive pads are ideal for everything from Cues and Loops to triggering one-shot sounds such as vocal tags, sound FX and more. There is also an OSC sampler built in to overlay 4 preset sounds including Noise, Sine, Siren and Horn, modulating the output using the tidal. This built-in sampler is ideal for triggering your own samples loaded to the banks in rekordbox DJ. An Active Censor is also included which can be controlled using the same feature within rekordbox DJ. This allows you to set in and out points, as well as apply Reverse Roll, Trans, Echo or Vinyl Brake FX to disguise explicit words. This is perfect for DJs who cannot find the clean version of a song, or want to play a song from an album in a watershed environment. In addition to the range of performance controls, the Pioneer DDJ-RZX provides you with a dedicated FX section with Sound Colour FX, Loop FX, Mic FX and more. Jam packed with advanced, professional FX, the DDJ-RZX gives you full control over your rekordbox DJ and external sound sources. You can even apply Sound Colour FX and Beat FX simultaneously for added versatility. You can also add sub parameters to the Sound Colour FX or use Sampler Repeat to change the length of a loop. The high-quality effects range from Delays and Echos to Flangers, Phasers and more. The dedicated microphone session even features a dedicated 3-band EQ and Mic FX including Echo, Reverb, Pitch or V-Tune. 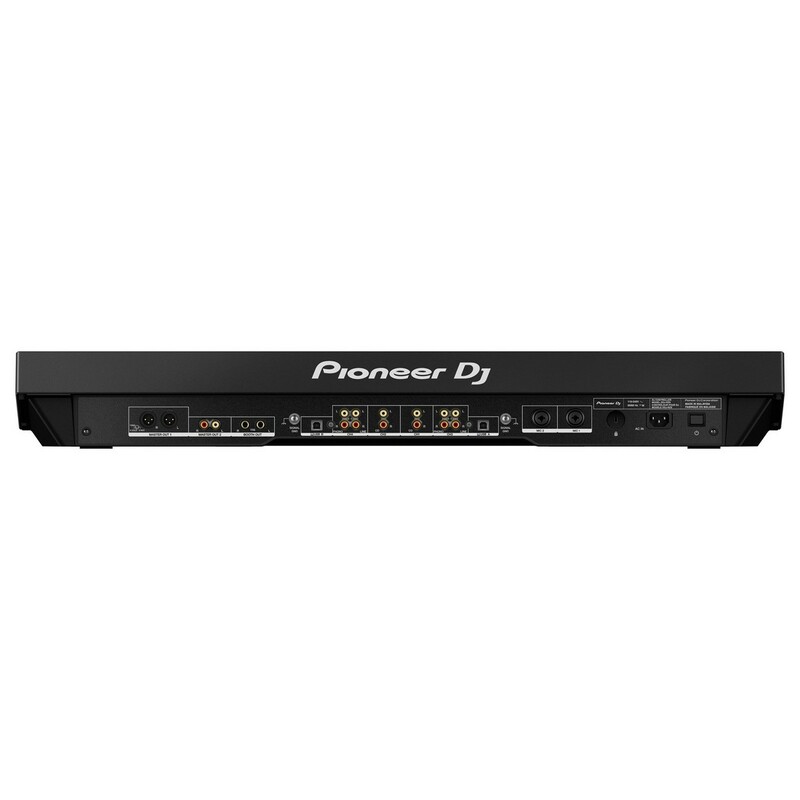 The Pioneer DDJ-RZX DJ Controller features a wide range of digital and analog connectivity, including 2 USB outs for connecting your controller directly to your computer. The controller also includes 2 combination microphone inputs as well as 2 phono (RCA) and 4 CD/Line (RCA) inputs. 2 headphone monitor outputs which can be switched from split or stereo for added versatility. The EQ, channel fader and crossfader curve can also be customised with on-board controls to cater to your own mixing/scratching style. 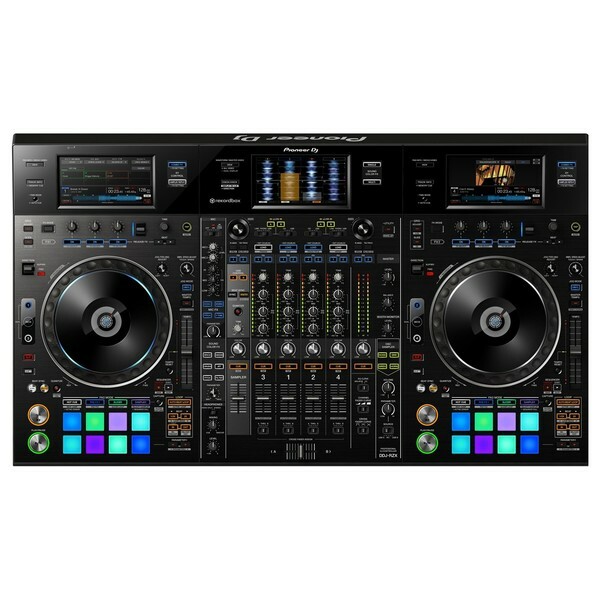 Additionally, the Pioneer DDJ-RZX DJ Controller comes complete with a free copy of rekordbox video, allowing you to load fvideos and images files to the controller.